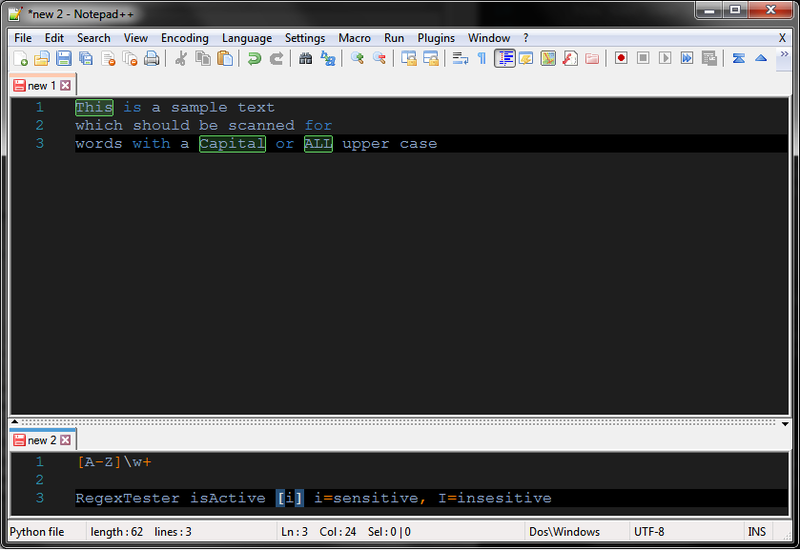 document which needs to be scanned has just a few lines - enough to test the regex. python script plugin needs to be installed, of course. How it should be use. You’ll see, that the second view shows a status message in line 3.
activate. One place can be modified, the [i] can became a [I] to toggle case sesitive. While typing your regex, the document in editor1 will constantly be updated about the matches. If there are sub matches, the “main” match gets colored without outlining, sub matches are outlined. For a better differentiation of “main” matches they get colored differently. 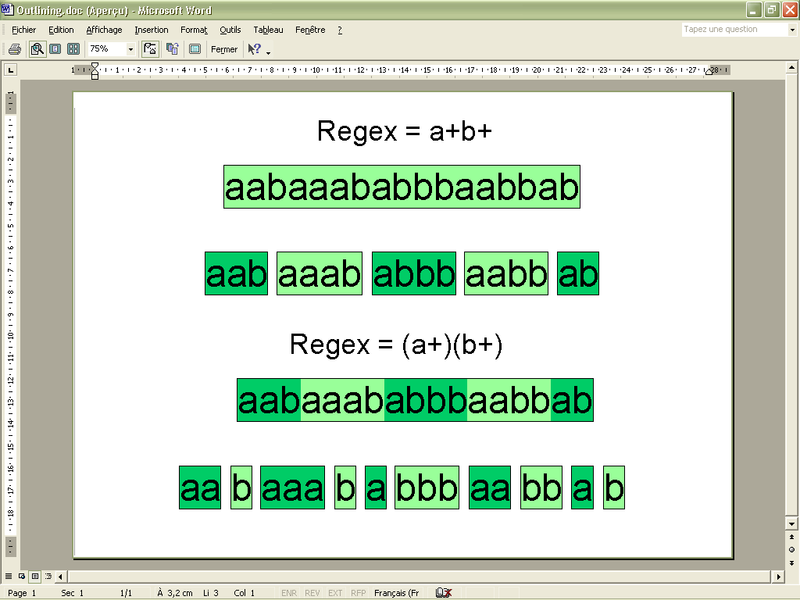 The script was inspired by the regex101.com site and the old regex tester plugin. let me know. Code itself has comments as well. some time before the document gets colored. if editor2.getLine(2)[22:23] == 'I':                                                # is it a case insensitive search? First of all, how to stop your script ?! May be, I miss something obvious ! Once, after an N++ re-start, I ran Regex Tester.py, but I omitted to open, before, a new document and to move it in the secondary view. Doing that, afterwards, I was surprised to get two tabs New 1 in the secondary view ! Let’s consider the subject string aabaaababbbaabbab On the picture, below, just under each regex, I indicated, first, the way your script highlights and outlines the matches, then, a new highlighting and outlining, just below. What do you think of, Claudia ? I don’t even know if it’s technically possible and not too hard to code ! But, please Claudia, take all your time, as it seems that you do hundred things, at the same time !! 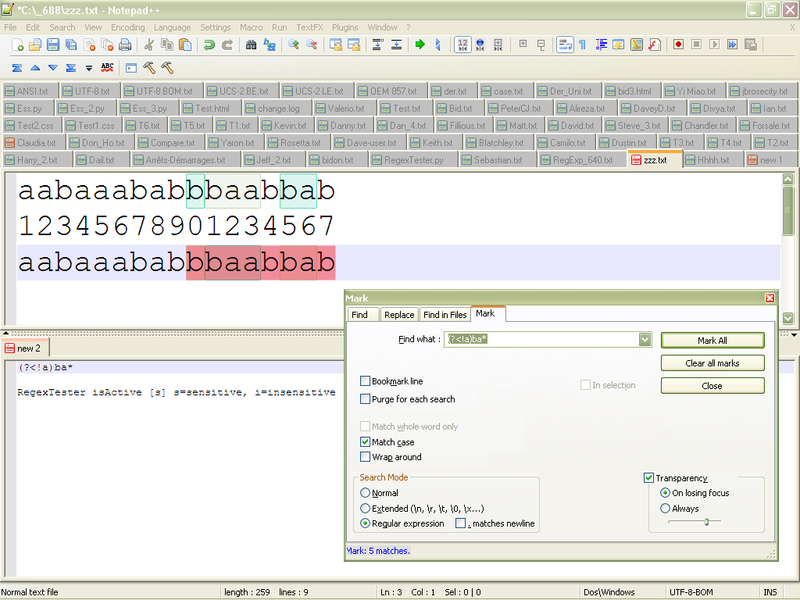 Make sure editor2 and the tab where RegexTester isActive… has the focus and then run it a second time. If you accidentally run it in another tab a second time you need to call it in that tab again. Once, after an N++ re-start, I ran Regex Tester.py, but I omitted to open, before, a new document and to move it in the secondary view. Doing that, afterwards, I was surprised to get two tabs New 1 in the secondary view ! When using the End of Line characters syntax ( \R, \r or \n) in a regex, they are not highlighted, even if the button Show All characters is set. Yes, I discovered this as well. It looks like scintilla/npp doesn’t allow me to color/access it. Obviously I cannot divide the letters but I see what you mean, I’ll think about it, should be possible. OK , after having focus on the new 1 tab again and choosing the option Plugins - Python Script - Run Previous Script (Regex Tester), I got, as expected, the text RegexTester inActive… and all the highlighting was suppressed ! But, why the option Plugins - Python Script - Stop script is greyed ? => Two tabs new 1 are displayed ! in regards to the two new1 documents, npp does this in the background. When you start npp with only one view open, npp already has opened a new1 document in second view. If you don’t access it, it gets deleted/replaced by the one which you move to the second view. New start of npp with one view result in one document named new1 which is visible. Another new1 document is available in second view but currently invisible. by new2 document. Not sure if this expected but doesn’t harm anyway. Improvements based on Guys comments. If second view isn’t active a message pops up complaining about this and abort the start. To stop the script you can execute the script a second time regardless which view is active. Coloring/Grouping changed - based on a even/odd differentiation. if editor2.getLine(2)[22:23] == 'i':                                                    # is it a case insensitive search? inputTab = console.editor.getProperty('RegexTester_inputTab')                               # do we have the bufferid of the previous run saved? newTabActive = 0 if notepad.getCurrentBufferID() == int(inputTab) else 1                # Has old tab been closed? But, why the option Plugins - Python Script - Stop script is greyed ? Technically the script starts, registers its callbacks and ends. Done. that the callbacks get executed by python script plugin. many many thx for doing all your tests and efforts. Very much appreciated. (I already discovered that functionlist regex behaves strange sometimes but now… - YOUUUU broke it ;-))) kidding. In regards to the François-R Boyer regex implementation I’m on a good way I think. Currently boost regex supports two ways of implementing unicode awareness. 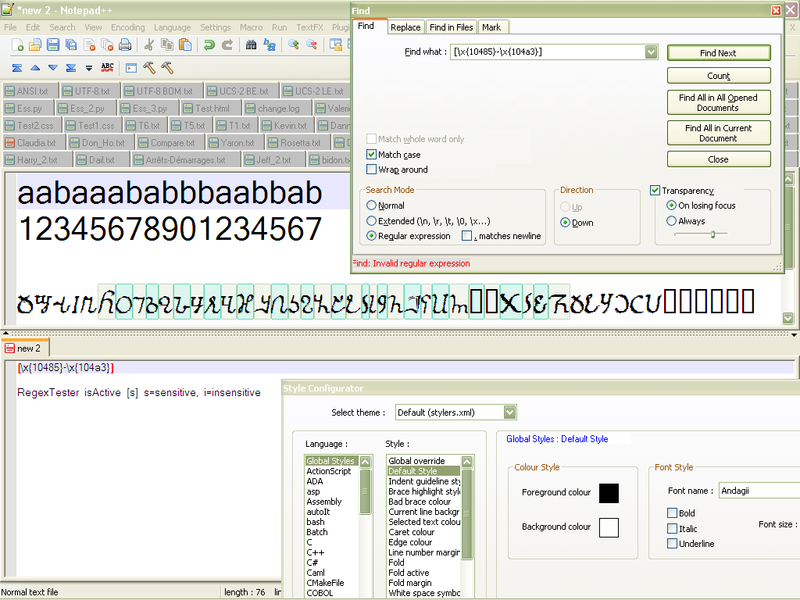 Relying on wchar_t, which is how Don implemented it and by using unicode aware regular expression types like François did. So, at the moment, I don’t see how I could merge both codes reasonably, that’s why I started to use François’s code to replace Dons implementation. I did the tests, of my previous post, with a 6.8.8 version, where I has, previously installed the Python plugin. I decided to verify if S/R are faster or not, with the François-R Boyer version, on the last 6.9.1 N++ version. And there’s a bad new, indeed ! sorry for answering so late - I had a day off - mostly bicycling and enjoying the nice weather. I thought since upgrading scintilla this lib wasn’t working anymore!!?? 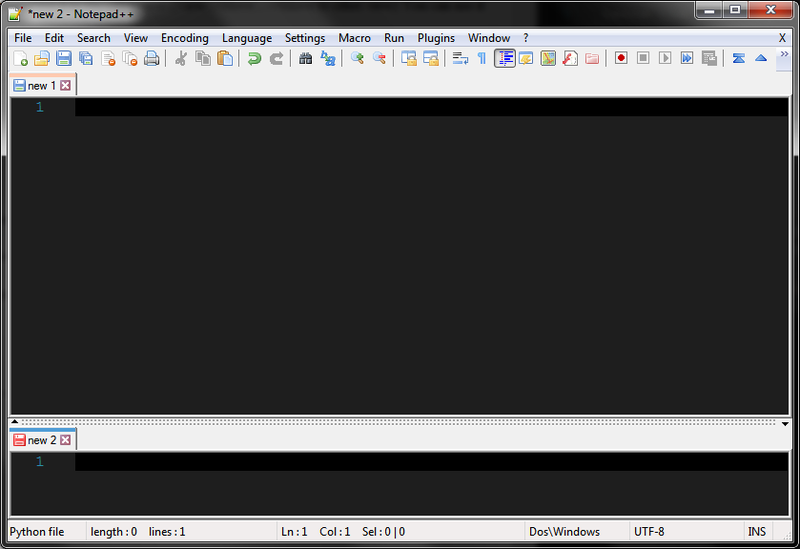 Because of that I didn’t test it - I will give the original code a try and see what it is complaining about.